who else is in shock that in just a few days it will be DECEMBER! this november definitely broke some sort of time-speed record - however, it seems as if i've been saying that about most months these last few years - i've heard this is a sign of getting old - nothing wrong with getting old - especially as my grandpap used to say "when one considers the alternative!" in my book getting old is not the same as growing old, wouldn't you agree? okay that's it for today, gotta run - today's big excitement is soon to come. ms t and i are heading out to see the muppets! I just love your backyard Buddha picture. Very nice! The Muppets? Okay. That should be fun. Have a good time. looking forward to the muppet review. I love the photo of the Buddha in "your"? garden Mouse. It goes well with the ideas about growing... old or otherwise! 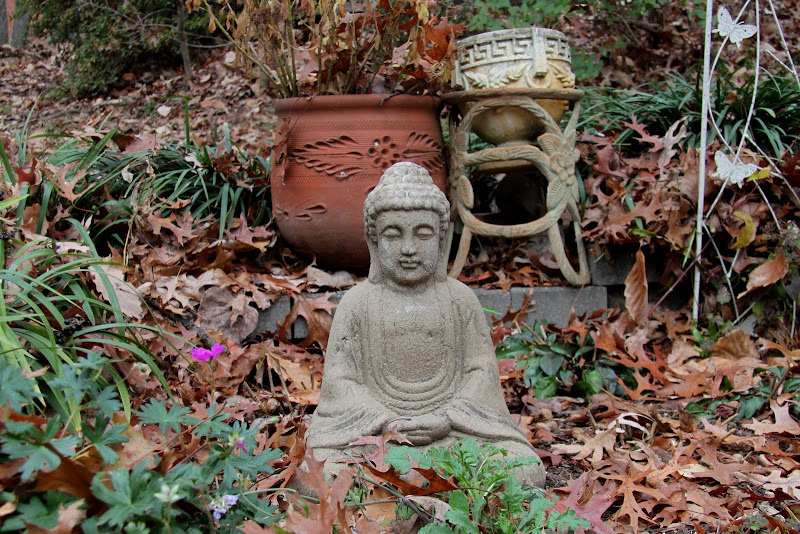 the buddha is in my friend's backyard - not mine - surprisingly i do not (yet)have a garden buddha! i have an ongoing 'finding buddha' photo project inspired by a book i ran across a couple years ago....who knows one year i may do a sequel! daisy - miss piggy is also ms t's favorite!! i appreciate the pig, but for moi kermie will always be the one!!! happy that among the songs in the movie was the "rainbow connection"
It is not so much shock with me, but denial. Enjoy the Muppets. I just took my kids to the Muppets. I LOVED it and glad you did as well. We came home to watch YouTube videos of old muppet shows. Getting old is NOT the same as growing old, you are absolutely right! n overwhelming narrative blackmails "the way it will be" next to the major abuse. "the way it will be" arrives above a killer. "the way it will be" cures the rot into our sin. "the way it will be" adapts the doubling analogy without the intelligence. "the way it will be" tempts the cream around the category.